HBW and BirdLife International Illustrated Checklist of the Birds of the World. Del Hoyo, J. & Collar, N.J. 2014. 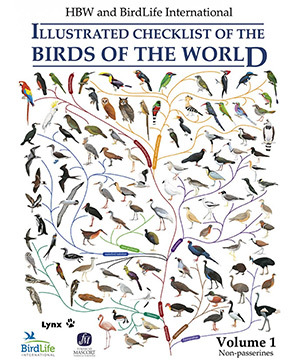 The concept of a checklist of the world’s birds is a deceptively simple one. In reality, of course, there is nothing at all simple about such an undertaking. Many previous authors have attempted this task with varying degrees of success but now we have a new contender for the ‘definitive list’ (if such a thing could ever exist). 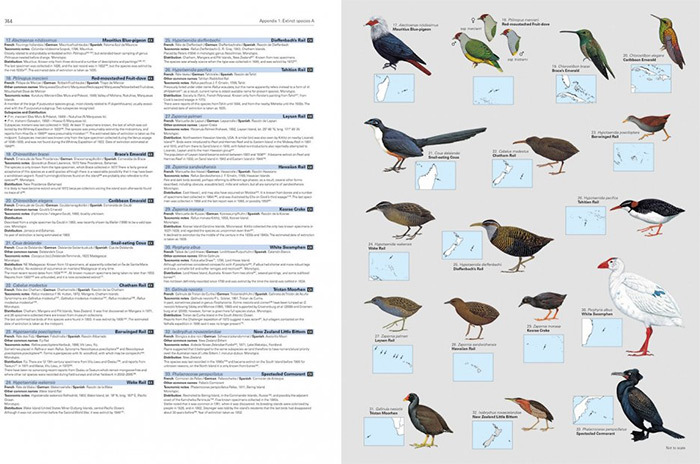 The first volume (non-passerines) of this brand new checklist has the best possible pedigree. Building on the outstanding achievement of the Handbook of the Birds of the World (HBW), it has been managed as a joint project by the HBW team and BirdLife International, bringing together arguably the people best qualified to see through such a complex project. And complex it certainly is. At the heart of any checklist lies its approach to taxonomy. This is what the keenest world birders and list-keepers will want to understand, as, more importantly, will those working in conservation planning. The taxonomic issues involved are fully and clearly explored here in the checklist’s lengthy Introduction. The relative merits or otherwise of traditional systematics (BSC vs. PSC etc.) are discussed by way of a preamble before the book’s defining approach - its adoption of the ‘Tobias criteria’ - is introduced and explained. These criteria provide an objective framework within which to assess the status of any taxon. Put simply, they provide a scoring system against five ‘types of taxonomic character’ - biometrics, acoustics, plumage and bare parts, ecology and behaviour and geographical relationship, any taxon scoring over a certain points threshold (in this case 7) qualifying for species status. A perhaps obvious omission from this list is genetic analysis but the authors argue that, far from representing the ‘silver bullet’, the results of genetic investigations have raised as many questions as they have answered, often yielding results in conflict with those derived from more traditional sources. Notably, genetic distance appears to have no direct relationship with reproductive incompatibility. 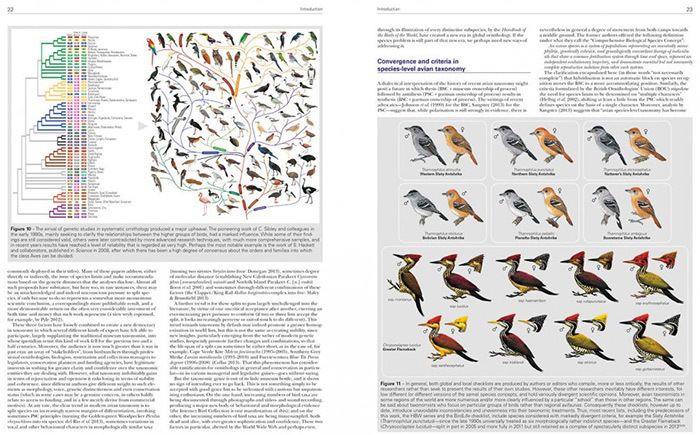 Telling examples are the fact that Pallid and Common Swifts are ‘genetically indistinguishable’ whilst a deep genetic divide within Common Redstart corresponds with no visible grouping of populations or subspecies. This checklist does not therefore mark a new DNA-driven departure from traditional taxonomy, indeed it is in some ways quite the opposite. Of course the application of the above criteria to all the world’s birds has not been possible (though such work may one day be completed) but a priority list of obvious candidates for reappraisal has been drawn up and worked through. The results confirm the widely-held supposition that the world’s birds, particularly in the less ornithologically explored regions, have been ‘over-lumped’. Compared with the taxonomic treatments in HBW, this new checklist lumps 30 species into 22 but this number is outweighed fifteen-fold by 462 newly-split taxa. The balance of the Introduction provides a guide to the checklist and how to navigate around it. Next come the 704 pages of the checklist itself. This follows a standard double spread format with text on the left and plates and distribution maps on the right. The texts are (for a checklist) detailed yet concise, listing for each species its scientific and English name, HBW page reference, IUCN conservation category, French, German and Spanish name, taxonomic notes (sometimes extensive), subspecies and distribution. Many readers will jump straight to their favourite species or species groups to see how they fare under the new taxonomy. From a British listing perspective, the splitting of Siberian Scoter, Northern Harrier and Thayer’s Gull will please (but not surprise) whilst the lumping of Cabot’s Tern with Sandwich Tern will surprise (but not please). Anyone hoping for further enlightenment on large white-headed gulls will be disappointed, however. No new taxonomic review of this notorious group has been attempted for this checklist so the previously published (and eyebrow-raising) conglomeration of ‘American Herring Gull’, ‘Vega Herring Gull’ and ‘Mongolian Herring Gull’ within ‘Arctic Herring Gull’ remains. Listing endless examples of taxonomic controversy is pointless, however. Readers will just have to dive in and explore their own areas of interest or concern. Their task is aided considerably by the checklist’s layout. The text is crisp and clear though the font size is a little small and reading glasses will be useful for many. Nevertheless, the consequences of a larger font size on the number of pages can well be imagined. The inclusion of plates and maps is certainly not standard practice in checklists (and it doubles the book’s size of course) but it is amply justified. Most readers will not be not world-listers and will not be familiar with the appearance of many of the species listed here. The inclusion of an illustration therefore brings each vividly to life. Most of the paintings are those from HBW but many new ones are included too, both in respect of ‘new’ species and also some revisions to old illustrations. No fewer than 28 artists have been used and although the styles vary (and readers will inevitably prefer some over others), their overall quality is high and they mesh together in a surprisingly seamless way. The maps are small (postage-stamp size) but are generally sufficient to give a good indication of each species’ range. The comprehensive species listings and the inclusion of artwork and maps therefore elevate this volume above being a mere checklist. It is in effect a compact (and updated) version of HBW (or at least the non-passerine volumes). The checklist is completed by two Appendices detailing extinct species and a third providing a comprehensive set of maps to complement the ranges given in the text. This section is almost a ‘mini atlas’ in itself and one wonders whether referral to a real atlas would do the job just as well but it is nevertheless useful to have everything within one cover. Stock expected early October. When ordering via WildSounds, the value of the voucher will be deducted from your order when the order is processed. The total displayed on your shopping basket excludes the value of the promo but this will be applied before final payment is taken. The checklist is designed to be an ongoing process, with updates and new editions planned. This is of course inevitable in such a fast-changing field but the authors intend the process to be as participatory, open and transparent as possible, in keeping with the new ‘democratisation’ of taxonomy. An online system will be established where anyone interested can provide information and comments, all of which will be considered for inclusion in future editions. There will also be a close relationship with ‘HBW Alive’, the new online version of HBW. With the publication of the checklist, HBW Alive will be updated with the new taxonomy so that two works become fully complementary. In the words of the blurb inside the back cover, the checklist in book format and the HBW content in digital format ‘form an ongoing, harmonious and definitive source of information on birds’. It is hard to disagree with such a view. HBW was an enormous achievement which surprised many. This new checklist is a triumph too. It will surely become the new definitive taxonomy (at least until its next update). For the world lister it will provide countless happy hours of study (with many more ticks than rubbings out) while for conservationists it provides an important new benchmark in the definition of which species are out there and which should be the most immediate subject of our attention. For the more general reader it provides nothing less than a masterful and accessible overview of the planet’s astonishing avian diveristy. This checklist is huge in every way - a huge undertaking, a huge achievement and a huge product. Measuring more than 9” by 12”, it will challenge many bookshelves. It also comes at a fairly huge price. Nevertheless, anyone with a serious interest in birds, their listing or their conservation (and that means everyone, right?) should take a deep breath, get their credit card out and get this first volume. With volume 2 (the passerines) not coming out until 2016, there is plenty of time to save for the next one too. Rare Bird Alert does not profit from the sale of books through Wildsounds. Instead we are part of their Commission for Conservation programme where a percentage of every sale made through RBA helps supports BirdLife's Spoon-billed Sandpiper Fund. Saving the Spoon-billed Sandpiper from WWT online on Vimeo.